This late spring snow we seem to keep getting is very strange. 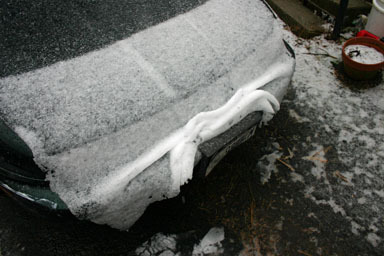 I was surprised to look out the window at my car and see that a sheet of snow had fallen down the hood, forming a strangely folded effect on the bumper. I just don't usually think of snow as folding. Temperatures and consistencies must be just exactly right, I guess.